M.E. Awareness Day: What is in a name? Trigger warning: I'm not going to be pulling any punches & some of the facts in this post are less than cheerful if I'm honest. My brain had a total melt down whilst I was doing the research & I don't think the post is any less stressful. Sorry. I have been really struggling to find the will to write this year's M.E. awareness day post; partly because I am down again in my ability level, partly because I feel like everything that needs to be said has been said by me or by any number of other M.E. bloggers & partly because I'm over it, you know? I'm sick of having to educate everyone I speak to over & over again about M.E. & what the difference between the diagnosis of CFS & actually living with M.E. are. I'm sick of having to fight doctors (& other 'professionals') for every bit of help I need. I'm sick of knowing that we suffer with two conditions, M.E. & institutionalised ignorance. I'm sick of being treated like I am choosing to be ill & that it's because I'm lazy or enjoying it or scamming the system or whatever. I'm sick of having a condition that is almost like a political position (like being big into recycling or something). I'm sick & tired of being sick & tired. 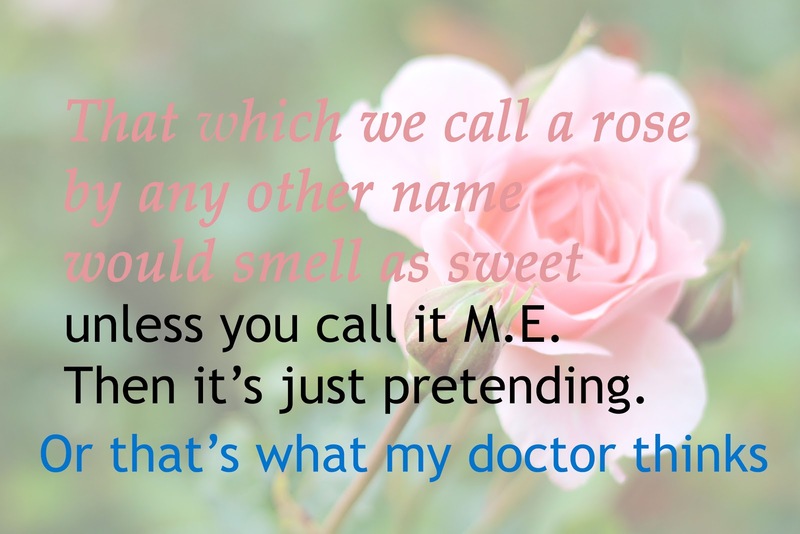 But honestly, what I am most sick of is knowing that if my doctors saw the name of any other condition on their computer monitors they would take my symptoms a hell of a lot more seriously. I'm aware that things are different in other countries but in the UK M.E. cuts you off from a lot of treatment/support/medical options. I can't be referred to neurology (despite M.E. being a neurological condition) because neurology don't deal with M.E. patients. I can't be referred to wheelchair services (despite being reliant on my wheelchair to leave the house) since I should 'just walk more'. I can't even get a sodding MRI scan despite huge numbers of neurological symptoms & the fact that, officially, a diagnosis of M.E. can't be made until all other options have been ruled out. Even in M.E. units sufferers aren't taken much more seriously. I know of bedridden sufferers, unable to even sit up, who were just told to exercise more. I know of sufferers who have been told M.E. doesn't exist & that all you need is therapy. And there are many, many sufferers who were discharged from the M.E. units set up (theoretically) to help us, when 'treatment' (exercise & therapy) didn't cure them despite the evidence piling up that as few as 4% of M.E. sufferers ever go into remission (much like other neurological conditions). If you compare this to the support offered to another, very similar, neurological condition - MS - the difference seems crazy. The NICE guideline states that if you have MS, you should have access to a specialist neurological rehabilitation team. This is because MS is a complex disorder that can impact on many aspects of your life so you will need to receive treatments from a number of different health professionals working together. They go on to list 9 different specialist including a neurologist, a specialist MS nurse & an occupational therapist. How is it that two complex, relapsing-remitting, neurological conditions resulting in fatigue, similar internal damage & very similar symptoms get such different levels of support? There are (according to official figures) more M.E. sufferers & M.E. sufferers are arguably more disabled by their condition (please read this link if you would like more information, it's fascinating if very depressing & densely written) yet we live in a position of almost constant ridicule & neglect. Writing this post is getting me super emotional & overloading my brain making it hard for me to explain how betrayed I feel by the lies I've been told by doctors & even some M.E. charities. The situation in the UK for M.E. sufferers is so toxic & we suffer so much, unappreciated & misunderstood even by our nearest & dearest. It feels impossible to overcome the ingrained societal delusion that M.E. is a choice. I'm not sure how to end this, it feels wrong to end it without some kind of silver lining but there doesn't seem to be one at this point. Because of a whole load of medical politics in the 1980s an uncalculable - uncalcuable because of the diagnostic 'muddying' the artificial label CFS has caused - number of M.E. sufferers are being left largely unsupported & untreated, even in the most basic of ways. Something has to change & I can think of no condition that formerly suffered dismissal like this that still is treated like they were. TB - that was once considered to be the condition of a certain kind of heart broken young woman - is accepted for what it is, cancer - that was once something that no-one would admit to having - is accepted for what it is & ditto for AIDS. Things change but it takes a village people! (Oh my gosh I watch too much RuPaul!). Research alone won't change the perceptions of M.E. ; there is a huge amount more research proving that M.E. is a severe neurological, biomedical condition than suggesting that it is a mild psychological condition & yet there is still this belief that we are suffering with 'yuppie flu'. The more we all learn about M.E. (sufferers, family, carers, doctors, the public etc) the closer we will get to the tipping point where things will change.